John Joseph The Life and Sufferings of John Joseph, a Native of Ashantee, in Western Africa: Who Was Stolen from His Parents at the Age of 3 Years, and Sold to Mr. Johnstone, a Cotton Planter, in New Orleans, South America. 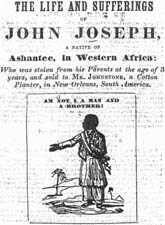 The Life and Sufferings of John Joseph, a Native of Ashantee, in Western Africa: Who Was Stolen from His Parents at the Age of 3 Years, and Sold to Mr. Johnstone, a Cotton Planter, in New Orleans, South America. Wellington: Printed for John Joseph by J. Greedy, 1848. Fugitive slaves -- Southern States -- Biography. Slavery -- Southern States -- History. Slaves -- Southern States -- Biography. Miller-Nichols Library Special Collection, University of Missouri—Kansas City, provided the text for the electronic publication of this title.